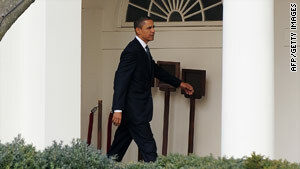 President Obama will mark one year in the White House next week. Washington (CNN) -- Americans are giving Barack Obama a split decision on his first year in office, according to a national poll released Tuesday. Forty-eight percent of people questioned in a CNN/Opinion Research Corp. survey said Obama's presidency has been a failure so far, while 47 percent of respondents said the year has been a success. The poll's release came just eight days before Obama marks one year in the White House. The survey indicated that Obama's approval rating as president stands at 51 percent, down 3 points from last month, with 48 percent disapproving, up 4 points from December. "On the plus side for Obama, he remains personally popular, and he gets decent ratings on foreign policy and national security issues. That may explain why his overall approval rating is a little higher than the number who say Obama's first year has been a success," CNN Polling Director Keating Holland said. "Unfortunately for Obama, domestic issues -- led by the economy -- are far more important to the public than foreign policy issues, and a majority disapprove of how he is handling every single economic and domestic issue tested." According to the survey, the economy by far remains issue No. 1 with Americans, with 47 percent saying it is the most important issue facing the country today -- up 7 points from last month. Health care, with 15 percent, is the second most important issue with the public, followed by the deficit at 11 percent. Terrorism is tied with the deficit and up 7 points from last month, most likely because of widespread coverage of the attempted bombing of a U.S. airliner on December 25. The dominance of domestic issues is most likely a contributing factor to the slight dip in Obama's overall approval rating. "Only 44 percent approve of how Obama is handling the economy; just four in 10 give him a thumbs-up on health care, and his approval rating on the federal deficit has plunged to 36 percent. Those are three of the four most important issues on the public's mind today," Holland said. "The president's ratings also suffer from the growing perception that he is too liberal," he said: Forty-six percent feel that way today, up 10 points from March. The poll also indicates that one in 10 people polled said Obama has not been liberal enough. But while the public takes issue with Obama in certain arenas, two-thirds continue to believe that he has the leadership skills and personal characteristics a president should have, which may explain why his overall approval is higher than his rating on the issues of public concern. The president's 51 percent approval rating is nearly twice as high as the approval rating for Congress. As the House of Representatives comes back into session Tuesday, only 27 percent of Americans have a favorable view of legislators. The CNN/Opinion Research Corp. poll was conducted Friday through Sunday, with 1,021 adult Americans questioned by telephone. The survey's overall sampling error is plus or minus 3 percentage points. CNN's Paul Steinhauser contributed to this report.